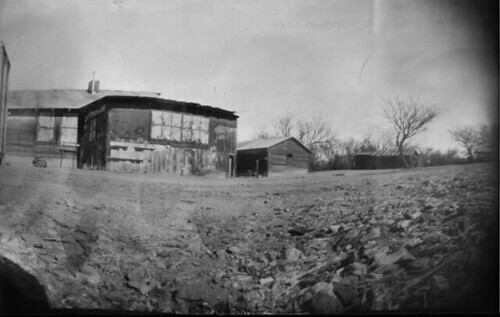 homemade paint can pinhole camera, paper negative, 33 second exp, post processed in Photoshop. Another view of Fairbank, just north of the schoolhouse, minutes before the reenactment of the attempted train robbery of 1900.. The structure on the left is a large house built in 1925. The building to the right of that is a double-occupancy privy (with "boys" and "girls" seats) and the building to the far right is the common livery stable, pictured here, from another angle. Image made in January, 2001.